Take a look at the world's first 3D printed CD player | What Hi-Fi? 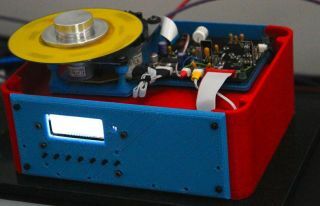 A group of developers have made what they claim to be the world's first 3D printed CD player – and they think it can match the performance of a high-end hi-fi machine. Botz&Us, a team of developers from the UK, is behind the project, with the leader of the team, 'Andrei the maker', telling 3DPrint.com that the performance of the player is "absolutely phenomenal". "I have been building speakers for about 12 years now," Andrei said, "so I was always very passionate about audio, music and building/modifying audio equipment... with 3D printing you can do some fancy stuff for vibration damping, combine different materials and create composite structures with pockets etc., to get very interesting damping and response." The CD player took around six hours for all the parts to be printed once the designs were finished, though that printing time is dependent on your equipment. Naturally, the team is happy with their work, claiming to have benchmarked the sound against players from the likes of Arcam, Audiolab, Burmester and Cyrus. "It is up there with these guys. Overall it is an amazing player and a great performer," Andrei said. Though he would say that. From the pictures we'd suggest Burmester's design team won't be touching-up their CVs quite yet, but it's certainly an interesting potential development for the manufacture of consumer electronics. It's not the first use of 3D printing we've seen in the hi-fi world - VPI recently launched a turntable with a 3D printed tonearm. To read more about the equipment used and the process involved in the 3D printed CD player, head over to 3DPrint.com.